What makes this relevant is the fact that Stapleton refuses to deal with it. Every time he says it doesn't matter, it matters more. But he's too stupid to realize it. Vote for me – I am more than qualified , look at my family history. Vote for me – my family history doesn't matter and no one should be allowed to bring itup. Hey- vote for me, I will say whatever you want to hear, so just assume I already said it and besides, I'm from Maine or Connecticut, not crazy Boulder. And my running mate … https://www.stapletonforcolorado.com/meet-lang-sias/. He has young kids and a big dog and they walk near a lake…. "Lang Sias is a husband, father, decorated combat veteran, commercial pilot, and citizen-legislator in the Colorado House of Representatives." Staplegun's family loves them some Klanpappy Benjamin – otherwise, they wouldn't keep naming their firstborn sons after him. Klanpappy Benjamin F Stapleton 1869-1950. Benjamin F Stapleton III, corporate New York lawyer and administrator of the Harmes Fishback foundation (the one that pressured the Colorado History museum to whitewash his grandfather's Denver Klan history). Then there is Benjamin F Stapleton IV, who was married in a fashionable New York society wedding in 2007. 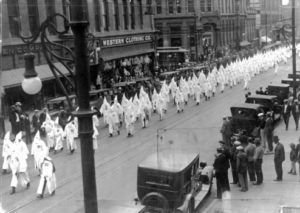 If they were ashamed of Klanpappy's legacy, they sure don't show it. do they keep the name out of some sort of enthusiasm for Benjamin Franklin? Do they think they are descendants? I did a bit of looking, but couldn't find any claim or explanation of why the original got the name. There's much to emulate in the original Ben Franklin; his wit and wisdom, his polymath inventiveness, his eventual renunciation of slavery (although he did, in fact, own slaves like every other Founding Father). He was also a notorious skirt chaser, and may have fathered any number of illlegitimate children in addition to the one (William), whom he acknowledged. But I looked, too, and didn't see any indication that the Bush / Stapleton clan had any connection with the Revolutionary era Ben Franklin. Klanpappy's pappy probably just thought the name lent a statesmanlike quality to its future politicians-to-be.